Oxycodone is a prescription pain medication used to treat acute and chronic pain symptoms. The drug has a high potential for abuse and dependence, and people can develop an addiction to it even if they take it as prescribed. People may abuse oxycodone by taking the pills, crushing them up and snorting them or mixing them with a liquid and injecting them. Long-term oxycodone abuse can lead to serious health problems, such as liver damage, kidney damage, respiratory problems, gastrointestinal problems and sexual dysfunction. Over time, people can also build up a tolerance to oxycodone, which increases the risk of overdose. Who Answers? to speak to a treatment support specialist about finding a rehabilitation program. Oxycodone can be used for both acute and chronic symptoms of pain. But it has a high risk for abuse and dependency, and the use of it must be closely monitored. While some people may safely and responsibly use oxycodone to manage moderate to severe pain, it remains a widely abused drug by those seeking only to get high. Oxycodone is a semi-synthetic opioid that is created by modifying the chemical structure of the opiate molecule known as thebaine (paramorphine). Thebaine is the organic compound derived from the opium poppy and is one of the active alkaloid chemicals that accounts for the strong analgesic effects. Outside of being manufactured into other substances—such as oxycodone, oxymorphone, and naloxone—thebaine itself is not used therapeutically. In the past, the United States has ranked above all other countries in the world in its use of thebaine for pharmaceutical manufacturing. People who have developed an addiction to oxycodone may need to seek treatment at a rehabilitation program. Addictions to painkillers such as oxycodone can be very difficult to overcome alone. Below are some common types of substance abuse treatment. Many people have found recovery in each type of treatment—it’s all about what works for you. Inpatient or residential recovery centers. Residential programs involve a high level of care and support. You remain at the facility during treatment and work with a multidisciplinary staff of medical and addiction professionals on overcoming your addiction. These programs often include detoxification as well. Outpatient recovery centers. People transitioning out of an inpatient program often attend outpatient treatment several times a week for a few hours at a time. But some people can also find recovery in outpatient programs without attending inpatient. These programs can include group and/or individual therapy. Dual diagnosis recovery centers. These are inpatient or outpatient programs that help people suffering from an addiction as well as a co-occurring mental health disorder such as anxiety, depression or obsessive-compulsive disorder. 12-step programs. Twelve-step programs include working with a sponsor through the 12 steps while supporting others on their recovery journey. It’s tempting to pick the first rehabilitation center that comes along or the one that’s nearby. But you may find it useful to get more information about oxycodone treatment and what factors can affect your satisfaction with a rehab program. Substance abuse program costs can range from free to tens of thousands of dollars a month. Whether the program is a luxury program, residential, outpatient or 12-step. Where the program is—nicer locations and programs in urban areas tend to cost more. How long the program is. Whether you have insurance and what it covers. Have insurance. Find out what your insurance will cover and what treatment options are available to you by calling a treatment support specialist at 1-888-319-2606 Who Answers? today. Don’t have insurance. The Substance Abuse and Mental Health Services Administration’s toll-free helpline can refer you to a program in your area that helps people struggling with drug abuse with no insurance. Oxycodone can be misused in a number of different ways. Prescription forms of oxycodone are available in several strengths, including 10mg, 20mg, 40mg and 80mg tablets. Individuals who misuse the oxycodone tablets may take the pills orally or rectally, or they may crush and snort the pills. Oxycodone can also be dissolved in a liquid solution, such as water, and injected either intramuscularly (i.e., directly into the muscle tissue), subcutaneously (i.e., directly under the skin) or intravenously (i.e., directly into a blood vessel). Oxycodone directly affects the central nervous system.2 As with other medications, even when used as prescribed, oxycodone can cause some side effects. Further, oxycodone is a narcotic, and similar to other narcotics prescribed for pain management, oxycodone may lead to impairments in daily activities, such as driving. Tolerance (needing higher doses of the drug to experience the high—increases the risk for overdose). Oxycodone withdrawal symptoms may begin to appear within 8 hours of not taking the drug and peak at around 36 to 72 hours. Problems with school, work and interpersonal relationships. Loss of interest in previously enjoyed hobbies. 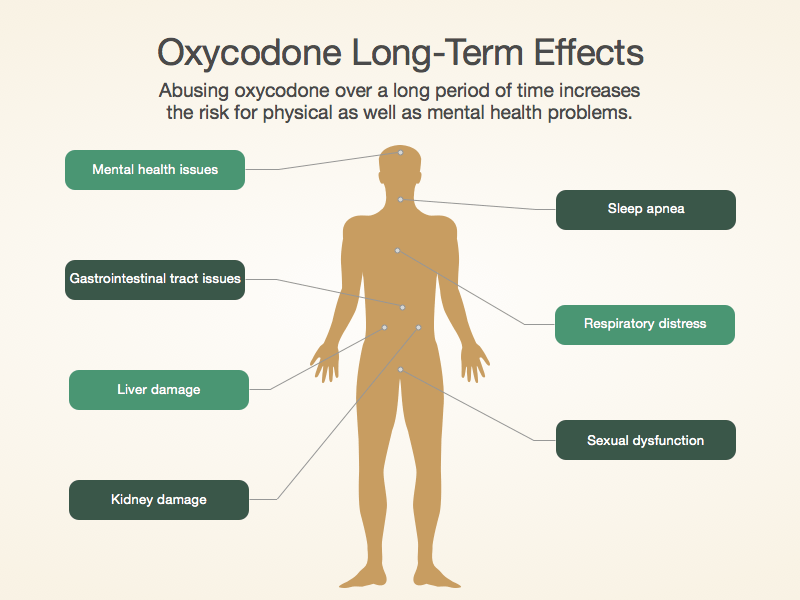 Increasing tolerance to the effects of oxycodone. Visiting many different providers for prescriptions. A person can develop an oxycodone dependency even if they take their dose exactly as prescribed by their doctor. Abusing oxycodone or taking more than the prescribed dose significantly increases this risk. Should oxycodone abuse and dependence continue untreated, the individual is at serious risk for developing a dangerous and potentially life-threatening addiction. Overdose can occur with oxycodone. Opioid overdoses essentially poison the functioning of vital brain centers, including that which controls respiratory rate. Call 911 immediately or visit the local emergency room if you or someone you know may be suffering from oxycodone overdose. Many teenagers falsely believe that it is completely safe to take prescription drugs rather than illegal drugs obtained from the street. This may lead them to misuse prescription medications under the false assumption that they are free from harm. Recent National Survey on Drug Use and Health data indicate that 1.9% of 12- to 17-year-olds reported misusing prescription pharmaceuticals in the past month. This rate was lower than the estimates from 2002 to 2011 and similar to those in 2012 and 2013. If you or someone you love is struggling with addiction to painkillers such as oxycodone, call 1-888-319-2606 Who Answers? —speak with one of our treatment support specialists about opiate recovery programs.
. Levy, EF, Victor, J. (2007). Opioids in medicine: A comprehensive review on the mode of action and the use of analgesics in different clinical pain states. New York: Springer. p. 371.
. Hays LR. (2004). A profile of OxyContin addiction. J Addict Dis 23(4):1-9.